Celebrate diversity through inclusion and learn how the talents and skills of people with differing abilities can enrich your work experience. This article is sponsored by Melwood. It does not reflect the work or opinions of NBC Washington’s editorial staff. To learn more about Melwood, visit melwood.org. Did you know that the unemployment rate for persons with differing abilities is more than double the rate for persons without them? Not only is that an unfair statistic, but this lack of inclusivity in the workplace can actually have a negative impact on the perception of businesses without a diverse workforce. Polls show that 92 percent of consumers reflect favorably on businesses known to hire employees with differing abilities, and 87 percent prefer to do business with these same companies. Though hiring persons with differing abilities may seem daunting, it’s actually crucial to the commercial success of any company today, in addition to facilitating employment opportunities for the differently-abled. The many misconceptions about hiring people with differing abilities stem from a lack of knowledge about the subject. The bottom line is that inclusion enhances the workspace for everybody: clients, employers, recruits, employees, and their families. One of the most effective ways to make your business more inclusive of persons with differing abilities is to work with Melwood. Founded in 1963, Melwood provides employment, job training, life skills improvement, and supportive and recreation services to individuals with differing abilities, including veterans, in the Washington, DC metropolitan area. As an AbilityOne contractor, Melwood provides services to the federal government, state and local governments, and the private sector, and employs nearly 700 people with differing abilities annually. 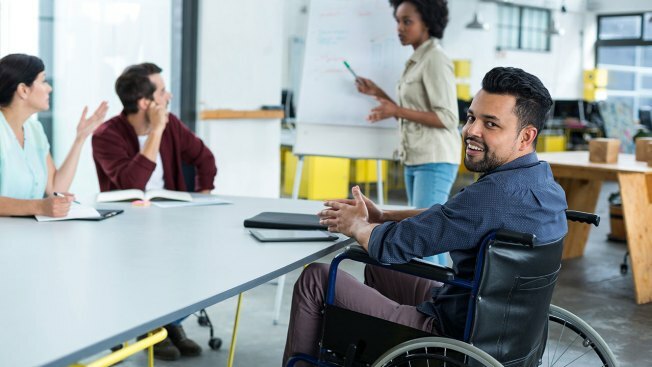 Now that you’re ready to hire persons of differing abilities, it’s also crucial to foster a culture of inclusion in your office so that these new hires can feel welcome. Here are some tips to help you get started. Treat people with differing abilities the way you want to be treated. Smile, be friendly, and speak normally. Do not offer assistance without asking first. Individuals with differing abilities have unique experiences and their own approaches to problem solving. If they need help, they will ask for it, just like you would. Whether it’s in the first steps of the interview process or a new employee’s first day of work, make it clear that you will provide reasonable adjustments as necessary. This may require an accessibility audit of your company, work hour rescheduling or even simply rearranging office furniture. There should be no barriers to recruitment or employment. 33 percent of people with non-visible differing abilities have not shared them with their employers. From fear of stigmatization, individuals with differing abilities may be hesitant to talk about it. However, open communication and honest talk about the value of inclusion can build the trust necessary for differently-abled employees to succeed. Not sure where to start? Invite a coworker to lunch! Make inclusion a part of company policy. Whether it’s a specific policy on differing ability inclusion or part of a larger policy on anti-discrimination, putting it in writing will show your commitment to building an inclusive workspace. If making this kind of change is not in your capacity, speak with a supervisor to find out how to make it happen. An inclusive work force drives economic growth, and can capture a larger market than the non-inclusive. It also often leads to creativity and innovation thanks to the collective ideas of a more diverse body of employees. In fact, at least 92 percent of employees with differing abilities rated average or better in job performance compared to 90 percent of employees without differing abilities. Join Melwood and play an important role in improving employment outcomes for people with differing abilities. Visit Melwood.org to help a person with a differing ability have a chance to achieve workplace success with vocational support services.